Vazirian, M., Dianat, S., Manayi, A., Ziari, R., Mousazadeh, A., Habibi, E., Saeidnia, S., Amanzadeh, Y. (2014). Anti-inflammatory effect, total polysaccharide, total phenolics content and antioxidant activity of the aqueous extract of three basidiomycetes. Research Journal of Pharmacognosy, 1(1), 15-21. M. Vazirian; S. Dianat; A. Manayi; R. Ziari; A. Mousazadeh; E. Habibi; S. Saeidnia; Y. Amanzadeh. "Anti-inflammatory effect, total polysaccharide, total phenolics content and antioxidant activity of the aqueous extract of three basidiomycetes". 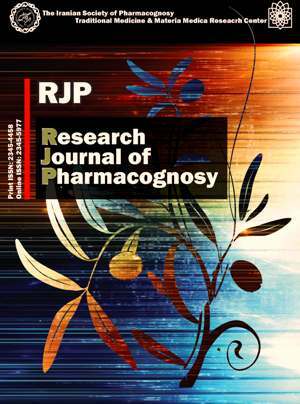 Research Journal of Pharmacognosy, 1, 1, 2014, 15-21. Vazirian, M., Dianat, S., Manayi, A., Ziari, R., Mousazadeh, A., Habibi, E., Saeidnia, S., Amanzadeh, Y. (2014). 'Anti-inflammatory effect, total polysaccharide, total phenolics content and antioxidant activity of the aqueous extract of three basidiomycetes', Research Journal of Pharmacognosy, 1(1), pp. 15-21. Vazirian, M., Dianat, S., Manayi, A., Ziari, R., Mousazadeh, A., Habibi, E., Saeidnia, S., Amanzadeh, Y. Anti-inflammatory effect, total polysaccharide, total phenolics content and antioxidant activity of the aqueous extract of three basidiomycetes. Research Journal of Pharmacognosy, 2014; 1(1): 15-21. 2Agriculture and Natural Research Center of Mazandaran, Passand Forest and Rangeland Research Station, P.O. Box 167, Behshahr, Iran. 3Medicinal Plants Research Center, Tehran University of Medical Sciences, Tehran, Iran. Inflammation is a part of the non-specific immune response which occurs in reaction to any type of injury. Medicinal mushrooms have had application in various disorders including cancer, liver injuries, inflammation and diabetes. In the present study, the anti-inflammatory effects of the aqueous extracts of medicinal mushrooms (Fomes fomentarius, Ganoderma applanatum and Trametes hirsuta) were evaluated using carrageenan method. In addition, total polysaccharide, total phenolics contents and the radical scavenging activity of the extracts have also been examined. Mushrooms were extracted with distilled water in 100 °C for 4 hours and then the extracts were freeze dried. Indomethacin was considered as the positive control in the anti-inflammatory evaluation. Polysaccharide contents of F. fomentarius, G. applanatum, and T. hirsuta extracts were assessed as 53.3±0.2, 31.7±0.03, and 19.1±0.6 glucose equivalent µg/100 µgEXT and total phenolic contents of them were successfully revealed as 9.9±0.2, 8.2±0.1, and 8.8±0.2 µgGAE/100 µgEXT, respectively. Furthermore, the IC50 values for F. fomentarius, G. applanatum, and T. hirsuta extracts in DPPH assay, were calculated as 90.9, 108.6, and 908.3 µg/mL, respectively. The results of the experiment showed that the extracts possessed potent anti-inflammatory effect which was comparable to indomethacin.